Marrakech is a vibrant and interesting city. Different in its way of life, it’s important to be well accompanied by someone who actually knows Morocco and its cities: Siroco Tours. Our tour guide – Rachid – was awesome and in a few hours became a friend who took us with joy, safety and inside knowledge to all highlights and other unknown tourist sites. Rachid is berber and he really made his origin shine upon our night spent in the desert. He was really amazing. Rachid speaks portuguese, which is a valuable asset in a country where french and spanish languages dominate. This is great for all portuguese speakers. 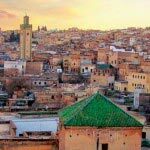 Morocco and its astonishing cities are better known and felt with Siroco tours organisation and Rachid. Me and my boyfriend had the opportunity to get to know the desert of Merzouga two weeks ago (3 day tour Marrakech – Merzouga – Marrakech). Already we knew that the tour would be, by itself, an unforgettable but exhausting experience. However, the tour organized by Siroco makes everything simpler and more comfortable. The guide (Rachid) was absolutely fantastic. In the middle of Ramadan had all the patience to answer our questions and to entertain us with a thousand and one stories. On top of that I was always in a good mood, available for photos and to stop at every wonderful landscape. The travel plan is made so that we do not feel the weight of the many kilometers to go, and the successive stops serve to know a little more about the culture and history of Morocco. The advices and organization by Alexandra and Pedro were great for this tour in the Desert! Jamal has been a fabulous guide during the journey because of his great knowledge and simpathy.. I trully recomend this tour for people going to Morocco if your looking for a different and amazing experience in the Desert!